We proudly use fresh, never frozen 80% lean, 6 oz. ground beef. All burgers dressed with lettuce, tomato, pickles & onion. 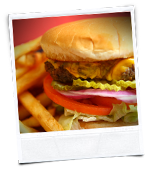 Served on a grilled bun and include choice of fries, potato chips, coleslaw or crisp garden salad or cup of soup, or substitute onion rings. This classic cheeseburger is topped with mustard, relish, diced onions, pickles, lettuce, tomato & mayo. NO substitutions on this one so don't even try. Classic no-frills burger, but DANG it's good. All American cheeseburger with all the goodies. Salute. Cheddar cheeseburger. It's twistin' time again! Green chilies & Monterey jack cheese. With bacon, American cheese & hickory BBQ sauce. Cheddar & Monterey jack cheeses. Roll over Beethoven! Served open faced. Smothered in homemade red chili & topped with cheddar jack cheese & diced onions. Smothered in homemade green chili & melted jack cheese. Served open faced. With sautéed mushrooms & Swiss cheese. "Oh, boy!" With cheddar cheese, bacon, sautéed mushrooms, guacamole & sour cream. Guacamole bacon burger. Annette sold separately. Bacon and cheddar cheeseburger. Rock around the clock. All natural garden burger with Monterey jack cheese.